This is just the beginning of a new source of information that will address our needs through virtual education with 321eLearning. If you have ideas for sessions you would like to see - even after the conference - feel free to email me! This year, we're changing the focus a bit on March 21st. For the 10th anniversary of this special day, we here at The Road are participating with seven other Down syndrome groups who created the "Random Acts of Kindness" campaign. This year, we'll be celebrating World Down Syndrome Day on March 21st (3-21) with the seven national Down syndrome organizations by completing random acts of kindness. We've started a list of possibilities that our adults who have Down syndrome can do. Follow The Road We've Shared - Caring for an adult who has Down syndrome's board Random Acts of Kindness on Pinterest. For those of us on The Road, WDSD was... hectic to say the least. Hectic in a GOOD way! I didn't want the month to end without talking a little bit about the UN panel discussion on health. If you missed the presentation, you can watch it via download. It's four hours of great speakers talking about - as you would expect, health care and access around the world. I was personally excited to see that one of Josh's doctors from when we lived in Maryland was speaking. Dr. George Capone from the Kennedy Kreiger Institute Down syndrome Clinic in Baltimore, MD is one of my personal heroes. He talked about guidelines that exist for newborns, and for children. These guidelines are published by the American Academy of Pediatrics. Dr. Capone mentioned that they were developed in 1994 and revised in 2001 and 2011. They apparently try to update them regularly. The only thing is - they stop at age 21. In preparation for our 321 eConference session yesterday, "Finding Support via Social Media - Blogging and Internet Communities" - I did a lot of thinking about WHY I choose to share my story on various social media outlets. In the 45-minute session, we had a lot to cover, and team member Mardra actually VOLUNTEERED to drive! (Love her!) Sidebar - you know you're in the right place, on the right path, when the members of your team each have a great resume of specific talents that are different from yours but at the same time they really GET you and you talk together like you've known each other FOREVER! I am grateful every day that I found them and that they can put up with my shenanigans. Why do you choose to share on-line? Why is it important specifically for advocates and people involved within the DS community to share their stories publicly? I managed to come up with "bullet point" or "Twitterized" versions of my answers to those questions for the purpose of the session, but I feel like I didn't really explain my perspective in terms of some of the recent controversies swirling around in our community. 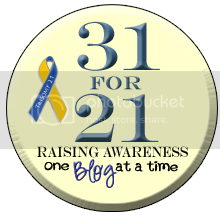 Originally posted 3/19/14 as part of the IDSC World Down Syndrome Day 2014 blog hop by Stephanie Holland. One of our very first pictures together.... never before (and never again) published. Yeah, we're Maryland born and raised. "Team mates" from the very start. Today has been so exciting and energizing! I've participated in the 321 eConference, and listened to Dr. Capone address the United Nations ! I've only begun to look through all the fabulous pictures and blog posts celebrating "designer genes" that have been shared online. Josh and I have danced to "I'm Happy" several times already today. And it's only just begun! Josh helped pick out these pictures and was "too proud with me" about sharing them for WDSD. He kept saying - "Look at us!" with a big ol' grin on his face. Indeed - look at us! The road may not have been easy, and hopefully there's a lot more to it! We'll keep working and sharing, not just for our family and friends, but for anyone who will listen. We love each other - we're happy - and we're grateful for the friends we've made along the way!